With a built-in video module, it is possible to hold secure videoconferences. It is also possible to share measurement and notes concerning patients. Citizens will be handed equipment in their own home so that they can make measurements on their own, for example lung capacity and blood pressure. All measurements can be made via bluetooth connection of all major appliances for chronic patients. The devices can be attached to mobile devices. Early detection of incipient disease is a tool for citizens based on KL schemas and the experience-based triage model. 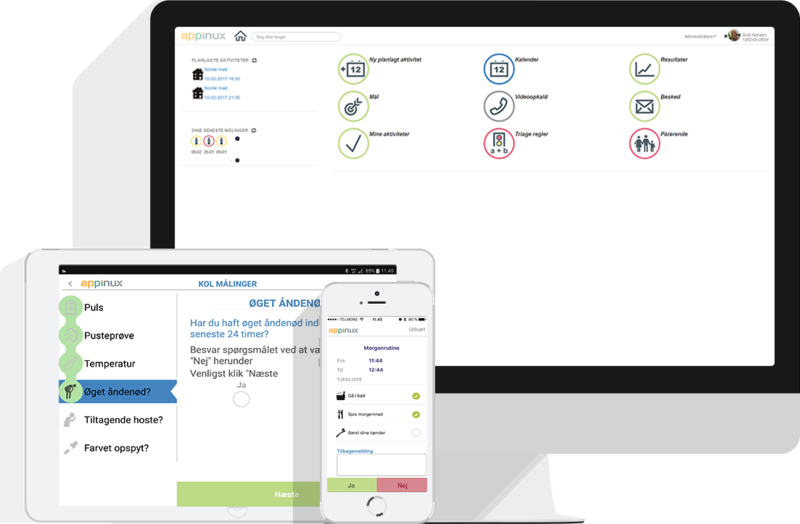 The module provides access to experiential triage and decision support for evaluating the development of citizens' health. Flexibility means that employees, citizens and relatives are given access to exactly what they need, in terms of their health and care needs. It is both via web and apps. Appinux can be adapted dynamically to the individual customer's needs. That means that an individual with a given diagnosis only sees relevant applications and modules, whereas the employee sees other applications and modules. Appinux is designed with modules or applications that appear on the front as icons. The icons are designed as illustrations that are easy to identify. The modules do all follow the same recipe, once one is learned, the rest is intuitively easier to use. It is the customer who decides who should have access to data in the system. Data can be pulled out of the system via CSV export. Openness is also in the way we integrate with other systems. Appinux supports integration and data exchange with strategic partners.